There are those who argue that the characters in Gilligan's Island are based on the seven deadly sins. But how does a scrawny little weed like Gilligan get paired with gluttony? Surely the Skipper is a more likely candidate for glutton? Ginger, on the other hand, is a slam dunk for lust. This morning I gave in to my lust for eggs at a place called "Gluttony, It's a Sin", 278 Smith Street, Collingwood, Tel +61 3 9416 0336. Curioius name. Great breakfast. 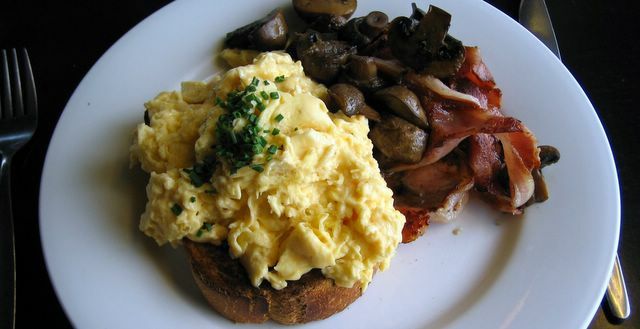 What I ordered was scrambled eggs with sun dried tomato and parmesan on cheese toast, with bacon, weiss wurst, mushrooms, mayo and chutney. It was very good and very filling. The only real flaws were an excess of juices (from the mushrooms I think), and runny chutney (it should be thick). What I should have ordered was the Scrambled Special... scrambled eggs topped with spinach (sauteed) and lime Dijon hollandaise on a potato, mushroom, onion and tomato fry-up all on a slab of thick cheese toast. Mmmm... as soon as I laid eyes on this towering stack of temptation I rapidly switched from lust to envy... I want what they're having. There were six other monster egg specials, including things like Pambula Eggs (fried with flathead fillets etc), Tex Mex (fried with bacon, sausage and chilli beans on corn toast) and a Warm Deluxe Breakfast salad type thing (poached on a mixture of baby greens, bacon, croutons, avocado, smoked salmon etc). Very creative and lots of choice. The atmosphere inside Gluttony is reasonable, although it lacks a bit of warmth, and if you grab a street table there's a fair chance you'll have to deal with a Smith Street nutter or two. One thing I'm not so sure about is the "breakfast bar" of self-service muesli, fruit, yadda yadda. I always wonder how long it's all been sitting there, going dry or collecting germs from the passing trade. At around 12 bucks for most of the big brekky specials, this place is great value. And the coffee was up there with the best I've ever had. The concentration of quality breakfast venues around Canberra is roughly inversely proportional to the concentration of pollies and hacks. But despite the slim pickings, there are at least a few places where you can get a decent plate of eggs. It might take you two or three days to visit them all, but two or three days in Canberra is usually more than enough for anyone. 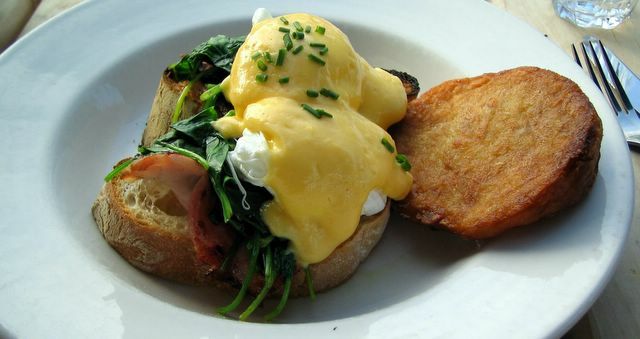 For Eggs Benedict (with ham, salmon or spinach), the place to go is Tosolini's, in London Circuit (corner of East Row), Civic, Tel +61 2 6247 4317. Very good indeed. Unfortunately, however, my serve of "Tosses" eggs was well below par... a measly little pile of scrambled eggs, dotted with flecks of some mysterious black pan-scraping substance. It came with a generous serve of bacon and some roasted field mushrooms, both of which were OK, but compared to the Benedict it was very disappointing. Another failed experiment, IMHO, was the poached eggs with spicy lentils and spinach. The lentils were too sweet, with vinegar dominating any other flavours that might otherwise have come through, and the spinach was raw (it's most unappealing state). I didn't get to try any of it, but the rest of the menu apeeared to offer plenty of choice, including a couple of omelettes, crepes with caramelised banana, toasted brioche with marscapone and fruit compote, and banana porridge. My vote: stick with the Benedict. It wins by a safe margin. 12/20 "Avoid the Tosses' Breakfast"
As far as I'm aware, the "milk bar" is a uniquely Australian version of the local corner store. Every suburb used to have at least one or two, where you could buy milk, bread, newspapers, mixed lollies and ridiculously over-priced groceries. Thanks to 24/7 supermarkets and 7-Eleven, many have gone the way of the Dodo. But Jerry's Milk Bar, at 345 Barkly Street, Elwood, Tel +61 3 9531 3078, has blended milk, bread, Pez and musk sticks, with eggs, bacon, toast and lattes to keep the flag flying. New Yorkers and Clockwork Orange fans should be warned that Jerry's is not a milk bar in the style of Korova, in the East Village. You won't viddy any droogy malchiks or devotchkas peeting late-nochy molokos here. Jerry's is strictly eggiweggs, jammiwams and other day-time fare. My scrambles were light but firm, with well grilled bacon and tasty fried mushrooms, all served on a slice of crunchy golden toast. Hard to fault really, although for a perfect score I think the "Hens in Clover" free range scrambled eggs needed an extra dob of butter. Other menu highlights included corn fritters with smoked salmon and salad, Jerry's "world famous" bircher muesli, and pancakes with banana and maple syrup. The Genovese coffee was good (although my second cappucino was over-filled and under-frothed), and the service wasn't bad, despite a hint of attitude. At times I wondered whether the staff might have been doing us a favour by allowing us to crash their private "in crowd" party, particularly as they cranked up some obscure "isn't this cool" CD to an annoying volume. But all-in-all, they served up great eggs and good coffee for about 15 bucks a head. Good value brekky. The conclave is over, the ballots are toast, and Benedict XVI is wearing the pointy hat. This afternoon, with his holiness on the mind, I enjoyed a fine serve of poached eggs and hollandaise at the North Road Pavilion, 2b North Road, Brighton, Tel +61 9596 9196. Strictly speaking, served with toast (not muffins) and a bonus serve of spinach, this was not textbook Benedict. So I'm calling it Eggs Ratzinger, in honour of the new Holy Father. It's a long way from the Holy See, but the Pavilion is blessed with some great sea-side views. Apparently it used to be a surf club (not that there are any nearby waves to speak of), until Simone Jones (a good Catholic girl, by the way) got her hands on it and made it into a cafe. Nice work Groaner, is all I can say. It's a great venue, and my eggs were excellent. My one gripe was the so-called hash brown, which was more like a fried disc of batter. It was all nice and golden, but it tasted awful. For dog owners, this place is perfect. Lots of outside tables where you and your pooch can relax, sniff around and soak up the view. Or, grab a breakfast baguette (with omelette, spinach, bacon and tomato relish) and go walkies. Woof. I think Cheap Eats has been hijacked by some kind of sweet-toothed cult of pancake lovers. The 2005 edition is peppered with comments on pancakes, hotcakes, poached fruit and other sickly muck. This year's winner of breakfast dish of the year - Replete Providore, 302 Barkers Road, Hawthorn, +61 3 9818 4448 - illustrates the point. They got the gong for their ricotta hotcakes with lemon curd and strawberries. They should have won it for the corn fritter and bacon stack, served with tomato and avocado salsa and sour cream. Best corn fritters I've ever tasted. Magnificent. Unfortunately for me, all I managed was a taste. My own order was the Replete Breakfast of eggs (scrambled with chives), Spanish sausage, hash cake (the drug-free variety), slow-roasted tomatoes (just average), bacon (well fried) and field mushrooms (the weakest link) on toasted Phillippa's bread with tomato relish. It was good, without being great. The Eggs Benedict looked extremely good, with well-grilled champagne ham, nicely poached eggs, well-toasted muffins and great hollandaise. Once again, I had to make do with a small taste, but I reckon I've found another contender for best Benedict. It was refreshing to be served by genuinely friendly staff (apparently with a tatoo that matches her ring), who handled every request without attitude or lip. At just under $20 a head for a great brekky and excellent Grinders coffee, this place makes the trip to suburbia well worth your while. They say hollandaise is a great hangover cure. So, if you threw back one too many the night before, head for the Botanical, 169 Domain Road, South Yarra, Tel +613 9820 7888. The Eggs Benedict are superb. Plan B? Skip the latte and go the Espresso Martini... chilled vodka slightly shaken with a measure of espresso coffee, Sweetener and Mozart Black Chocolate Liqueur served with a small jug of cream. Mmmm... hair of the dog. I won't bang on too much about the Benedict, but suffice it to say, the eggs were very good, the hollandaise excellent, and the muffins properly toasted (at last). Next time, however, I think I'll have to try the full wood roasted Botanical breakfast, with cheese kransky, smoked bacon, baked beans, black pudding, roasted tomatoes, field mushrooms, toasted muffin and poached eggs. Serious breakfast. Hefty price ($19.50). If you're about to battle the weekend hordes at Ikea, but you're too late for the mega-bargain breakfast (eggs, bacon, sausages, tomato and coffee for $2.50), don't fret. Wander down to the river and treat yourself to some free range eggs at Fenix, 680 Victoria Street, Richmond, Tel +61 3 9428 3699. It'll cost you a few extra bucks, but it's worth every cent. Perched above the delightfully brown waters of the Yarra, Fenix disproves the rule that you can't get decent food and a decent view in once place. Grab a table on the terrace, relax, and watch the world peddle/paddle by. Despite being a card-carrying member of the deconstruction school of molecular gastronomy, Raymond Capaldi's breakfast offerings are pretty tame. There's no blackberry omelette with parsnip ice-cream and blue-cheese chocolate sauce on this menu. Nonetheless, the standard breakfast fare is done pretty well, and the service is very good. I went for the Fenix breakfast of scrambled eggs, bacon and roasted tomato, with a few pork snags on the side. The eggs were rich and creamy, but too much like a pile of slop for top marks. The bacon was OK, but I prefer my pig charred. And the toast was plonked on top of the rest... like a cherry on a scoop of ice-cream. Maybe this was the deconstructionist touch? The Eggs Benedict were good, as were the home-made hash browns, although both were slightly underdone. Other tempting options included a three cheese grilled omelette, and a cassoulet of haricot beans, chorizo sausage and fried free range eggs. The ricotta hotcakes with honeycomb butter and fresh banana also sounded good. Last, but by no means least, the Lavazza coffee was excellent. Eggs and a coffee will set you back around 16 bucks. Admittedly more than Ikea's $2.50 loss leader, but good value nonetheless. Today, after giving Kamel the flick (tip to the owners, sack the surly staff), we parked ourselves at an outside table at the Albert Park Deli, 129 Dundas Place, Albert Park, Tel +61 3 9699 9594. The poached eggs were perfect. But, as they say, the devil is in the detail... and the detail is where points are lost. Before I stick the boot in, a few words of praise. The Deli served up an excellent pile of home made beans... specifically, red kidney beans in a thick, tasty tomato-based sauce. And, as mentioned above, the eggs were poached just right, with whites cooked through, and yolk lightly cooked, but still quite runny. First mistake: raw spinach. This may be a personal thing, but it's a big one for me. Spinach, IMHO, is a leaf best served cooked, or at least wilted. Sauteed spinach tastes fantastic. Raw spinach is bland and boring. If you must serve fresh leaves, try rocket, it tastes good raw. Or, at the very least, add the words "disgusting raw spinach leaves" to your menu, so I know what not to order. Second mistake: plate clutter. I'm always frustrated by a plate of eggs that requires significant engineering work before you can safely take your first bite. In this case, the eggs were served alongside the toast, which in turn was balanced on the edge of the plate. Moving the eggs atop the toast was reasonably straightforward, but with its thick and unstable design, I ended up with what can best be described as a poached egg catapult. Physical challenges like this tend to undermine the whole breakfast experience. Third mistake: bacon rinds. This may seem petty, but when bacon is served rind-on, I think "lazy chef". It's not like I'm going to eat the rind, so why serve it up? Cut it off. I'll thank you for it. Now, having got those grumbles off my chest, a word about the specials menu, which had some great options: corn fritters with bacon and maple syrup, banana and passionfruit bircher, breakfast cake with poached pear and cinnamon King Island cream, or open omelette with bocconcini, basil and roasted tomatoes. The service at the Albert Park Deli is limited to table delivery... you have to get off your arse to order and pay. But is was quick, despite being busy. The Moccopan coffee was pretty good, too. At $29 for two serves of eggs and coffee/tea, it was a good value brekky. 13/20 "perfect poached, raw spinach"